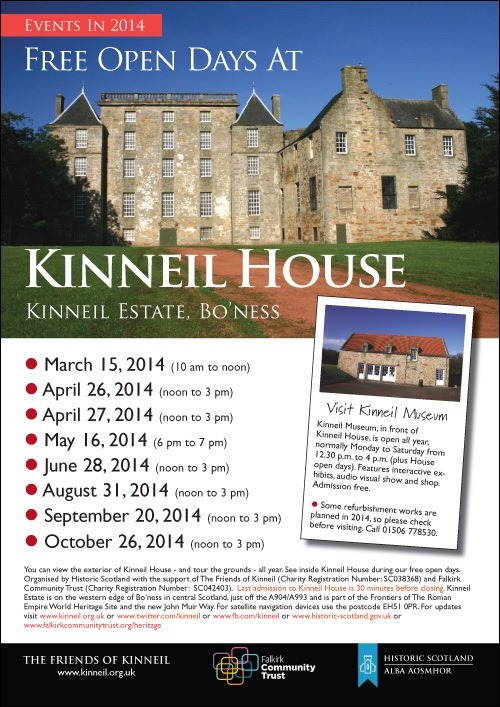 Free open days are taking place at historic Kinneil House and Estate in Bo’ness this weekend. Visitors will be able to see inside the A-listed mansion, meet a costumed interpreter playing one of its former residents and tour the surrounding parklands – now part of the new John Muir Way. Mini Kelpies from the Helix park project in Falkirk are also making an appearance. (See picture below). Kinneil House – which boasts impressive renaissance wall paintings – will be open from noon to 3 p.m. (last admission 2.30 p.m.) on Saturday and Sunday (April 26 and 27, 2014). Maria Ford from The Friends of Kinneil said: “Kinneil House is a wonderful place to visit and I’d encourage people to come along and enjoy the free tours. “This weekend will see the appearance of a costumed interpreter playing Anne, Duchess of Hamilton. “John Muir may be credited as being the father of America’s national parks – but Duchess Anne was surely the ‘mother’ of Kinneil Estate. Three hundred years ago she re-shaped the look of Kinneil House and its surrounding parkland. To celebrate the launch of the new John Muir Way – the cross-country walking route (which includes Kinneil) – Historic Scotland Rangers plan to run nature walks around the surrounding estate this weekend. The RSPB will also be at Kinneil Museum to promote the Inner Forth “Futurescapes” project – making local landscapes more wildlife-friendly. The Museum (beside Kinneil House) will be open on Saturday and Sunday afternoons to support the open days. The museum features hands-on exhibits, an audio visual show about the estate and a small retail area. This weekend’s open days are part of a series of events in 2014. See www.kinneil.org.uk/freein2014 for more details. The Mini Kelpies at Kinneil. ** The history of Kinneil dates back to 1323 when lands were granted by King Robert The Bruce to Walter Fitzgilbert of Hamildon, the head of the family which later produced the Dukes of Hamilton. ** The Hamiltons’ main seat was in west central Scotland but over the centuries Kinneil became their base in the east. In the 1400s they built a small tower house just outside what is now Bo’ness, in an easily defensible position overlooking a ravine. ** In the late 1400s or early 1500s the tower house was enlarged. In 1553 James Hamilton, 2nd Earl of Arran, built a palace to the north east of the tower house to its north east. In 1667, William, 3rd Duke of Hamilton and his wife Anne launched a major expansion of Kinneil House. Within a century, however, the Hamiltons had ceased to use Kinneil, and rented it out to tenants. ** Demolition work at Kinneil took place in the 1930s, but work was halted when rare renaissance wall paintings were discovered. ** The Friends of Kinneil was set up in 2006 to support and promote the development of Kinneil House and the surrounding estate and area, and to enhance and protect its heritage. ** Kinneil House and Estate are on the western edge of Bo’ness in central Scotland, just off the A904 and A993 and are part of the Frontiers of The Roman Empire World Heritage Site. The site also features the ruins of a medieval church, a cottage used by inventor James Watt and evidence of a Roman fortlet, part of the Antonine Wall. 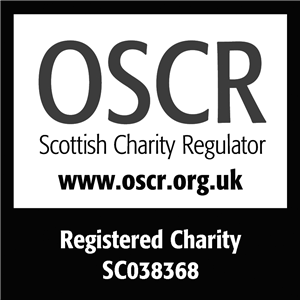 ** For satellite navigation devices, use the postcode EH51 0PR. ** Images of Kinneil House and Estate are available on request from The Friends of Kinneil. 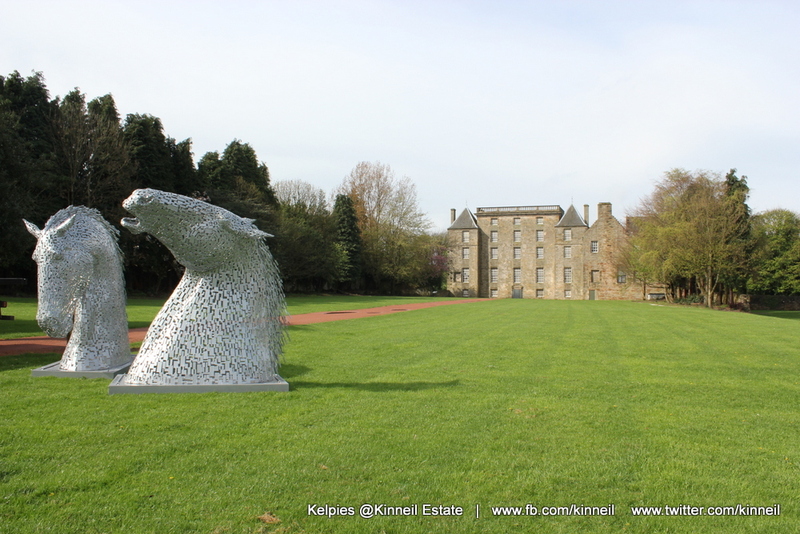 Email: publicity@kinneil.org.uk or download directly from http://bit.ly/kinneilpics (must only be used for press/editorial purposes). This entry was posted in Inner Forth Landscape Initiative, John Muir Way on April 22, 2014 by Friends of Kinneil.